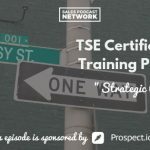 Today on The Sales Evangelist we’ll talk about planning and setting effective goals. It’s that time of year again where we find ourselves contemplating our achievements over the past 12 months. Some of us reached our sales goals and some of us did not, but we can all benefit from reflecting on what worked well, and what did not work at all. 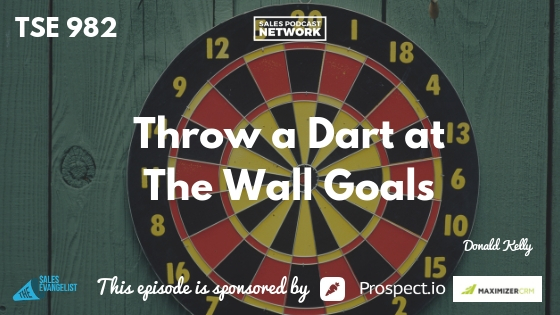 There’s a difference between setting goals by ‘throwing a dart at the goal wall’ versus setting goals based on the experiences that we are guided towards by the people we meet. A ‘throw a dart’ goal is as simple as choosing a random number – say $80,000 for example – and then setting that as your commission goal. But why that number? Are you simply hoping to make $80K, or do you have an actual plan in place to achieve it? I hope I lose 10lbs next year, I hope I win the lottery, I hope we get out of work early… Those are all just hopes because there is no plan in place to accomplish any of it. You have no control over the outcome. The problem with repeatedly setting goals that are not based on fact is the likelihood of failing to meet them. It becomes a vicious cycle. We fall short of our goal, we feel deflated as a result, and we stop trying. Learn from the experience of others. Talk with your teammates that have done well or talk with your manager. 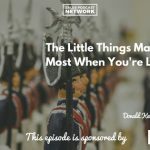 Find out what goals they set when they were new to the business. What steps did they take? What is a reasonable goal in their opinion? Put your goal in writing. Once you have decided on a reasonable goal, write it down and put it where you can see it. Studies have proven that goals that are written down are more likely to be achieved because there is a confidence that comes from taking that first step. Focus on fewer goals. This may sound counterproductive but do you really have the time and energy to reach your sales goals, be the top seller, get 10 new clients every week, go to the gym every day, travel the world and achieve those lofty 10x goals? Wouldn’t it make more sense to break it down into fewer achievable goals instead? Divide the goal into manageable pieces. The beauty of the book The Twelve Week Year is that it breaks the entire year down into 12-week increments so that you can take your goal and divide it into quarterly goals. How many appointments, how many new clients, how many presentations etc. do you need, on a quarterly basis, to stay on track? Put those calculations into your calendar and work toward them on a regular basis. It really helped me to achieve my goals because it is so manageable. I can focus on what I need to do each day or each week to achieve my end goal instead of just hoping that it magically comes together at that end. We’ve had our best year yet at The Sales Evangelist and I want to make sure you can do the same. I’ve been in your shoes and I really enjoy helping new sellers however I can. We are already planning for next year by taking a look at what we’ve accomplished this year and what we hope to accomplish moving forward. I hope that today’s podcast will help you do the same. Get a free download of the Twelve Week Year, as well as a 30-day free trial of the audible version, at audible trial.com/TSE. Check out our Facebook group, The Sales Evangelizers. It is for sellers all over the world to share insights, ideas, ask questions, and so forth. I hope you enjoyed the show today as much as I did. If so, please consider leaving us a rating on Apple Podcast, Google Podcast, Stitcher or wherever you enjoy fine podcasts. And be sure to subscribe to the podcast and share with your friends!